Cast: Bryan Cranston, Edward Norton, Bill Murray, Jeff Goldblum, Greta Gerwig, Frances McDormand, Courtney B. Vance, Harvey Keitel, Liev Schreiber, Scarlett Johansson, Tilda Swinton, F. Murray Abraham, Frank Wood, Yoko Ono. 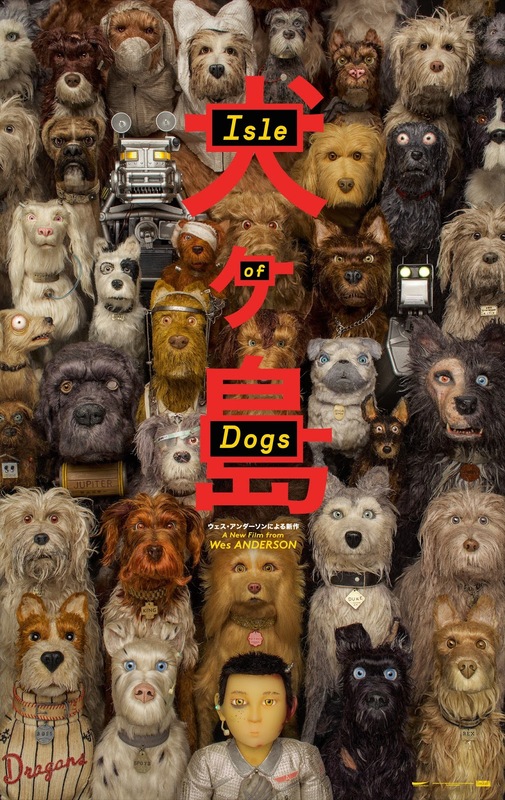 Isle of Dogs, Wes Anderson’s 2nd foray into stop motion, is a charming and thoughtful tale of mans best friends. Wes Anderson’s film is filled with his usual hipster hallmarks which people either love or hate. Its all here in spades so if you’re not a fan of his distinct style this won’t change your mind. Those who do enjoy his style will find plenty to love here. The direction and craftsmanship is top notch throughout making it one of the most visually arresting films of the year. The voice cast is filled with Anderson regulars and a few newcomers like Bryan Cranston. Cranston provides the emotional center of the film and really gives the story its heart. Like most of Anderson’s films there’s a streak of sadness through the entire story. Isle of Dogs does have a slightly bleaker outlook than usual and the story has a fairly obvious allegory to current events which makes it more dense than expected and one of Anderson’s best.